VITEC have officially launched 2 new products today, the Litepanels Gemini 1x1 Soft RGBWW LED panel and the new Titon battery range from Anton/Bauer. A great new product that delivers similar performance to its predecessor only this time it's half the size and half the weight, nice trick if you can do it… and it looks like Litepanels have done just that! The new Gemini 1x1 RGBWW Soft Panel is a true RGB light that offers the same light quality as the 2 x 1 Gemini with full control over temperature, brightness, hue-saturation and RGB values. Adjustment is a piece of cake using the controls on the back of the unit and the LCD screen. This is made even easier as the lay-out of the controls is identical to the Gemini 2x1. The unit has 6 pre-set buttons on the back from which you can select a range of colour temperatures from 2700K to 6000K. These can also be used as user assignable pre-sets which are simple to set up. The Gemini 1x1 can be powered via AC or 2 x V mount or Gold mount batteries. Controlling this unit remotely can be achieved via Wi-Fi, standard or wired DMX or Bluetooth. 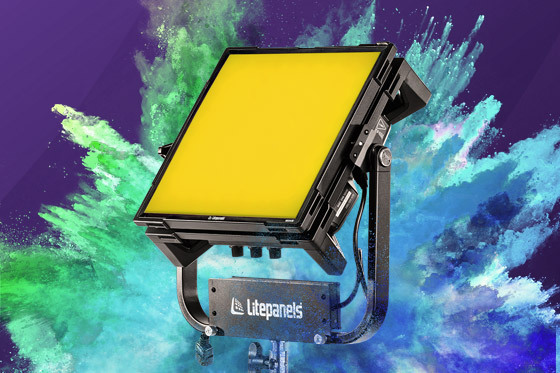 In summary the Litepanels Gemini 1x1 is a true RGB light which utilises the latest RGB plus warm technology that produces a full spectrum, accurate daylight and Tungsten light with the ability to dial in any colour plus a wide selection of lighting effects. Perfect light instantly available: Every colour at your fingertips. Total control of light with four lighting modes; CCT Mode for true daylight and Tungsten with fine tuning; HSI Mode to create any colour in the 360 colour wheel; Gel Mode to quickly dial up many popular gels, and Effects Mode for a dazzling array of creative lighting effects at your fingertips. Serious Stability: Flicker Free Light with no colour shift. Flicker-free light at any frame rate or shutter angle and at any intensity level perfect for creating slow motion shots with ultra-smooth dimming from 100% to 0.1. Anton/Bauer has just announced their new battery range the Titon, which are Lithium-ion Ion batteries designed for filmmakers on the move. They are capable of powering a wide range of equipment in the field or in the studio. 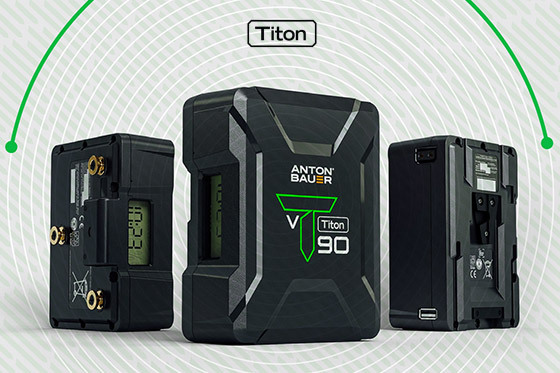 Available in V-Mount or Gold Mount, Titon enables users to take advantage of Anton/Bauer’s superior mobile power technology. Using the on-board LCD or your viewfinder you can see exactly how much runtime remains. It’s also smart enough to take into consideration everything being powered, including devices powered by the High-Speed USB and P-TAP. As with anything designed by Anton/Bauer it has a high build quality. It can withstand the most extreme environments, including temperatures from -20C to 60C (-4F to 140F). Titon battery is lightweight and safe when traveling and can power DSLR, Mirrorless, or 14.4v cameras, as well as LED fixtures.